Can one man deliberately invent a successful new word? Is it possible to break into the dictionary? What is a pratdigger? On January 25th 2006, comedian and wordsmith Alex Horne celebrated his TKDay – his 10,000th day alive – and decided to mark the event by doing something truly remarkable. Already a successful joke-writer, Alex wanted to take the next logical step, he wanted to devise his own word. He wanted to create a brand new verbal concept and successfully implant it in the English language. In 1791, a Dublin theatre owner called James Daly proved it was possible. After a colleague had wagered he couldn’t come up with a word that would catch on by the end of that weekend, Daly hired a group of street urchins to write “quiz” – a previously unknown sequence of letters – on the walls around the Irish city. Within 24 hours the word was common currency. People didn’t know what it meant so presumed it was some sort of test. Could Alex replicate this feat (bearing in mind that story is almost certainly untrue)? Nowadays, verbal gardening isn’t so easy. Urchins are harder to find, more expensive to hire and most walls are already caked in their graffiti. But after much careful planning, daring stunts and almost a thousand days of sneaky verbal trickery, Alex is making progress. His new words have appeared in nearly all the national newspapers, on Sky News, the Daily Politics Show and in an interview with George Alagiah witnessed by 250 million people on BBC World. Even TKDay (noun: one’s 10,000th day, a major turning point in one’s life) is beginning to catch on. Come and see him spread the word further in his most ambitious show yet, a multi-media neologistic bonanza tracking the highs and lows of this secret linguistic campaign. “Alex Horne’s comedy stand up is a distinctive mix of the geeky and the quietly rebellious. He’s obsessed with words and how we use them, has a penchant for puns and is a virtuoso of the vowel and consonant. He covers a lot of territory in this densely packed and neatly plotted hour. It is structured around ten words and phrases which Horne is trying to get into the dictionary by spreading their use around the world like some kind of verbal virus. The show cleverly incorporates video and TV clips to chart Horne’s success in planting the word ‘honk’, meaning money in Hornespeak, on BBC news, in learned journals and newspapers. He also talks to two versions of himself onscreen, interacting with his alter egos at unpredictable moments. There an anarchic subversiveness ticking away in the background throughout. Horne is a micro-disrupter, trying to make his mark on the world in small but pervasive ways. He takes on Wikipedia with an urban myth about Natasha Kaplinsky and coins a word meaning pretentious from an overachieving friend’s surname. I can state with confidence that I am the most honest critic on the Fringe. This is in a rather specialised sense of the word, however. 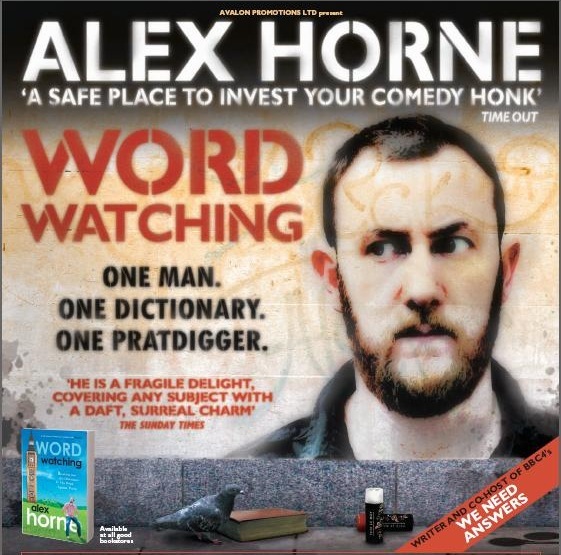 Comedian Alex Horne’s show Wordwatching is an amusing account of his quest to introduce various new words and usages into the English language. One of these is a new sense of “honest”, meaning “fat”. His greatest success so far has been in usage of the word “honk” to mean “money”, but any lexicographer would rapidly notice that the several instances currently in print or media record are all by Horne himself. Consequently, he appeals for the audience to aid him in spreading the word (literally) and to offer contributions of their own. It’s a show worth a few quid of anyone’s hard-earned honk. Have you had your TKday? Alex Horne has, and wants others to celebrate their 10,000th day on the planet. But he needs help in spreading the word. To mark his own TKday, Horne set himself the task of getting a new word in the dictionary. Beyoncé did it, he says, with bootylicious, Catherine Tate with bovvered, so can a man whose last Fringe show was about twitching – once known as plain old birdwatching – do it too? With a generous dollop of affability moderating his fast-talking erudition, Horne isn’t doing badly at all. Requiring proof of a word’s use before including it, lexicographers could be directed to more than Horne’s occasional vandalism of Wikipedia. Reeling off examples of his would-be neologisms from web chats, e-mails and the national press in a slick presentation, Horne also shows an excerpt from BBC World where he informs George Alagiah that ‘things cost a lot of honk in London’. And he doesn’t mean anything to do with a car horn. A gentlemanly sort with a potentially impressive handlebar moustache, he displays a meticulousness bordering on obsession. Neither this, nor his love of sophisticated software, hinders or distracts from his rolling flow. He has something of Mark Heap’s nervy, self-effacing bluster; take the tech away and you’d still have a tautly written, charmingly delivered show. It’s admittedly too dry for those seeking pint-splooshing guffaws, but if you’re curious to take a ‘mental safari’ and be enlightened about ‘pratdigging’, this is almost word perfect. THIS is a joyous show for word-lovers everywhere. Horne is right back on form, and on a mission to get a new word into the dictionary. This is his best show since Making Fish Laugh made everyone laugh. It is beautifully structured, endearingly honest, and features not just one but three perfectly synchronised Alex Hornes. Horne is making good progress, he tells us, in his attempt to become the “Oldest Man in the World”, but that is very much work in progress. Meanwhile, he is working, with a secret cabal, on infiltrating a cluster of neologisms into the English language. He is doing quite well, with the help of the press (academic and tabloid), Countdown and the internet. Horne is an engagingly smart man, a sort of Dave Gorman of the intellect. He has created a genuinely smart show. He not only entertains, amuses and impresses, but he makes you want to join in. Don’t be a pratdigger, go and see the show.